Remember when calling something "The Cadillac of (whatever)" really meant something? Those days may be dawning again, if the new Cadillac CTS is any indication. This 2008 CTS is the real deal, a fine sedan that, in my experience, is truly competitive with the offerings from Germany and Japan to which it will be compared inevitably. Within minutes of having taken possession of a brand, spanking new White Diamond CTS4 you could have knocked me over with a feather. I drove the last (first) generation CTS when it first came out and I liked it. But I didn't think it was going to give the Mercedes/BMW/Audi/Lexus/Infiniti gangs many sleepless nights, and it probably didn't. This new one should. And considering the generous incentives and warranty GM is known for, it seems like it'll undoubtedly be a heckuva buy in this market segment. There's a lot to like here, from a not so sharply-hewn exterior to a luxurious, comfortable and efficient interior. The exterior is recognizable immediately as the "new Cadillac" style, with sharp creases in the fenders that set the marque apart from other carmakers. But unlike the previous CTS, this one is smoother, so you don't feel that if you ran your hand down one of those creases it would come away bloody. From the front, you're hit immediately (and hopefully only figuratively!) by the new and more vertical "dual-textured" grille Cadillac says was inspired by its nifty Sixteen concept from a couple of years back. In pictures I'd seen I thought this new schnoz was a step backwards, but "in person" it's a big improvement, attractive and making the statement that Caddy's back with a vengeance. 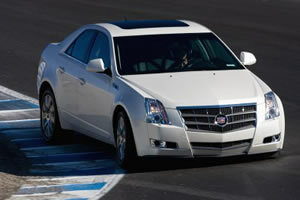 The CTS' more athletic look is enhanced by sculpted fenders that emphasize its wider track. The front fenders feature side "air extractors" that look like an updated blast from Cadillac's past. Even the chrome is done tastefully and doesn't look the least bit garish. From the side, the car's lines are nearly coupe-like, despite the presence of four doors, and the tush's vertical tail lights and angular deck looks both classy and sporty at the same time. And get this: Caddy offers a "double" sunroof (called "Ultraview") that gives front and rear passengers a nice view of the sky - though it only slides back halfway, like a conventional sunroof. And when I opened it on the highway it not only didn't give out the horrid "whoof whoof whoof" that can cause a nearly instant headache, but the road and wind noise were low enough that we could converse between front and rear passengers. 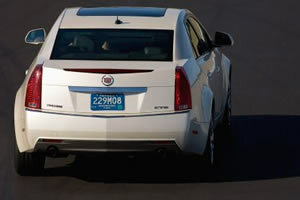 CTS is motivated by a very smooth 3.6 liter, direct-injection V-6 engine with variable valve timing. It cranks out 304 horsepower @ 6300 rpm and 277 lb.-ft. of torque @ 5200 rpm, both of which are more than adequate. Another 3.6 liter V6 is also available. It produces 263 horsepower and 253 lb.-ft of torque, which is probably more than adequate as well (though I'm glad I had the extra ponies!). Rear-drive CTS models offered outside the U.S.A can also be equipped with a 2.8 liter engine that develops 210 horsepower and 194 lb.-ft. of torque. All of these V6's burn regular unleaded gas, which may come as a pleasant surprise when it came time to fill 'er up. 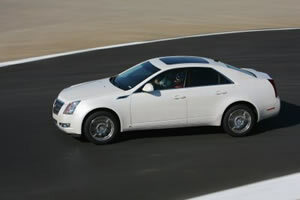 The 2008 CTS is available in rear and all-wheel-drive configurations. My sample was the AWD version, which came in handy during my extremely cold and snowy time with the car. It may be all wheel drive, but it felt for the most part like a conventional RWD car, which means you can slide its bum a bit when the roads are slippery - and that's more fun than a "strict" all wheel drive car. The power gets to the wheels via a Hydra-Matic six-speed automatic transmission with a sporty "pretend manual" mode. An Aisin six-speed manual is also available, as is a limited-slip differential. Suspension is all independent; my test unit had the sport suspension option and it balances the luxury with performance ride very nicely, neither jarring nor "nodding agreeably" over frost heaves etc. The interior is attractive (a huge improvement over the original), well thought out and high tech without beating you over the head with the technology - other than, perhaps, the LCD screen that raises itself up from the center stack in a very cool way. When it's lowered, the info on it is truncated into what you'd get from a conventional center stack display, but when it's raised you get the advantages of navigation system and audio and other controls - all operated by a simple touch screen control rather than forcing an MMI or iDrive type knob thingy that's the bane of many other cars in this class. It's a wonderful way to interface with the car, though (to pick a nit) it's just a tad far away for my stubby little arms. I loved it just the same, though. The knob-and-button interface for most functions is there if you want it, but in my never humble opinion the touch screen is so much better. I also like the classy-looking analog clock in the center stack, and the analog instrumentation, augmented by a digital multi-function display, is clear and clean. You can show an abundance of info on the digital display, from tire pressures and gas mileage to your current speed. The seats are comfortable, and heated and ventilated up front. For some reason Cadillac has chosen not to offer heated seats for the rear - in fact there weren't even heater controls back there other than "on/off" for the vents - which seems like a bit of an oversight in this league. Materials, of the seats and the interior as a whole, have a look and feel of quality. Cadillac says the front seats incorporate "thin-seat" technology to achieve maximum comfort while enhancing leg, knee and foot room for those in the back. 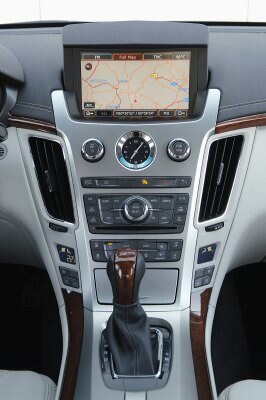 The leather-wrapped steering wheel includes standard integrated controls for cruise and audio system. It isn't the most comfortable steering wheel for drivers who like their hands at nine and three o'clock (it's fine for "ten and two"), but that's pretty nit picky. The audio system of my sample was first rate. It was the upgraded Bose 5.1 channel system with integrated hard drive (for storing your favorite digital files) and I was thrilled to discover it plays DVD-Audio discs, even to displaying their menus on the LCD screen (or not, depending on the disc - but that's a disc thing more than a Caddy thing). Audio quality is very good, with plenty of power and good overall tone and balance. My test unit also had XM satellite radio built in, integrated into the touch screen system, and it was live for my test. I love satellite radio and am glad to see it being adopted by an increasing number of manufacturers. The power mirror and window controls are mounted where at first it may appear strange: they're down low on the door on a panel that extends from the storage pocket rather than being on the arm rest. But in practice it works really well: they're nicely at hand yet out of the way enough that you don't accidentally lower a window. A small, but very nice touch. My test unit also had power front seats and the driver's side has two seat memory positions - and you can store the position in memory while you're driving, which is a wonderful feature. You can't recall them while moving, but that's okay. With many such systems you have to stop the car and put it in Park before you can save the settings, which is undoubtedly as safety feature but which is also a pain in the neck. Other little things delighted me, including "three blink" turn signals for lane changing, a heated windshield washer system that works well (the regular washers do a nice job of spraying the windshield, too), rear ultrasonic park assist, and power tilt/telescoping steering column. My test unit also had the optional remote car starter. These are common aftermarket contraptions, and it was sure nice to have with the temperatures during my test hovering around minus 40. You activate it by pressing the door lock button on the key fob, then holding the start button for a few seconds. The car fires up (and its lights come on to let you know) and will run for 10 minutes. When I came out, the interior was warming nicely and the windows were well on their way to being cleared. The "smart key" keyless entry system works beautifully. Just approach the car and pull the handle and the door unlocks. You can also program the system to lock automatically without having to press a little sensor on the door like you do in many other such systems. The trunk is big (and the rear seat splits and folds), though its opening is a tad small. But it has a nice, handy handle for pulling the lid shut, a nice balance between a power trunk and getting your hands all yucky in inclement weather. A cargo net does a great job of keeping your groceries from sliding around when the driving gets spirited. 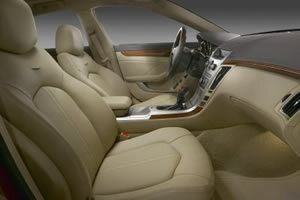 Safety equipment includes dual stage airbags up front, front seat side airbags and head curtain airbags front and back. I've only scratched the surface of the various amenities the CTS either comes with, either standard or available as options. But you get the point: this is a fully featured car. It's also a very nice car to drive. It's no wonder, then, that the 2008 Cadillac CTS won Motor Trend Magazine's 2008 "Car of the Year" award. The Cadillac CTS starts at $33,490 U.S./$38,900 Cdn.